Sign up FREE above and choose the 5km, 10km or full 42.2km event. Download the FREE “RunSocial” app for indoors (iOS) or “RunSocial GPS” app for outdoors (iOS & Android). Once you have signed up, installed RunSocial / RunSocial GPS and logged in you will see a countdown clock appear in your app. If you install RunSocial GPS to an iPhone and have an Apple Watch, we recommend you enable RunSocial GPS for your Apple Watch. 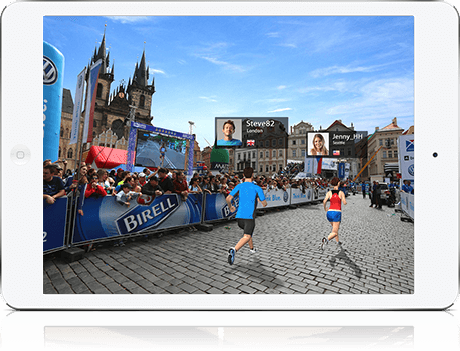 Download FREE the Prague Digital Marathon video route in the RunSocial app. The route comes in 4 video sections. More detail on video route is provided below. IMPORTANT: Please be on WiFi when downloading the video route to avoid potentially high network charges. RunSocail GPS does not use video. Before the event, go through the Checks and Tips List. For indoors, with your Apple device on your treadmill console, log into RunSocial and select your Input Speed Method. Be ready to run as the RunSocial countdown clock approaches zero. For RunSocial (indoors), the video will auto-load at 30 seconds (you can also tap on clock before then if you want). When the clock reaches zero your running speed will start your video (indoors) and map will strat to track you (for outdoors). The event has started and you are running! Others in front of you will appear live as avatars. You will also be able to view the leaderboard showing other participants although not necessarily all of them as we limit runners per room (and create multiple rooms). To access leaderboard in the video tap the icon in the bottom right corner, for RunSocial GPS tap/swipe to view the screen to the right. RunSocial GPS: the app will default to trying to connect to GPS when you open it. Once connected the Start button will glow orange. You can alternative go to the menu and elect to connect to the Polar Stride Sensor footpod. Manual: in this mode, simply adjust the video speed once in the video by swiping side to side or using the buttons that appear when you touch the screen. Treadmill direct: if you have access to a one of our partner Treadmills including Life Fitness, Nautilus, Star Trac, Landice and Woodway. See Help in the RunSocial menu for more guidance on the specific models). 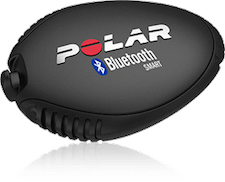 Footpods: if you have the Polar Stride Sensor footpod, you can connect be selecting Sensor connect in the Speed Tracking menu and then tapping on your footpod bluetooth signal. RunSocial / RunSocial GPS apps are up to date: You can check this by going into your App Store app on your device and selecting Updates. If RunSocial is there, click to update, if it is not, your version is up to date. Video is fully installed if using RunSocial: each video section thumbnail should have an orange corner strip with RUN written on it. If not, the section needs to be downloaded. Apple devices are fully charged and, if running indoors, is safely mounted on your treadmill: ideally, it is also connected to a further power source via the lighting cable or a second battery case. Internet is connected and working: the bandwidth does not need to be big – it needs to be reliable. View it on the big screen: if you have access to a TV you can connect your apple device to that via HDMI or Apple TV. However, it is essentialy your Apple device also has access to power or it will not last the distance. The entire route is available FREE in the RunSocial app - simply click on the video thumbnail and then select to download. The full route comes in 4 video sections. Once downloaded, as you run the videos they will automatically connect into a continuous uninterrupted route. Seeing a video section picture does NOT mean it is installed. There also needs to be an orange corner strip with RUN displayed. Only after it has been downloaded will it the section picture display the orange corner. Please be on WiFi when downloading the videos route to avoid potentially high network charges. 1.9GB on more recent devices (iPhone 5S, iPad Air, iPad Mini 2, iPod Touch 6th gen, iPad Pro and any later of these models). 2.9GB on earlier devices supported (iPad 3 and 4, iPhone 5 to 5c). 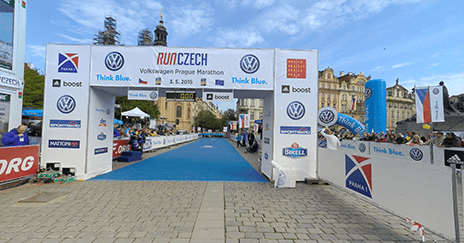 As with all RunSocial routes, the Prague Digital Marathon route is more than just a video. 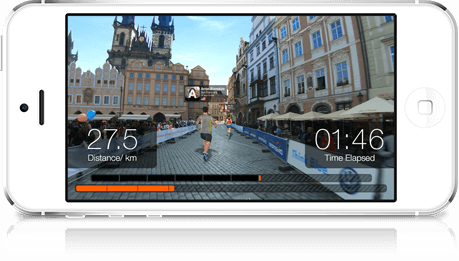 The route includes a special "mixed reality" capability which enables you to to see the avatars of others runners which will appear live inside your video.